Roof Coating to Extend the Lifespan | El Paso Roofing Co. There are many ways to protect the longevity of your roofing. This is especially important when it comes to the inclement weather we experience in El Paso. Harsh winds, freezing cold, hail, rain and of course the intense heat and UV rays of summer. All of these are elements that a roof coating can take care of. 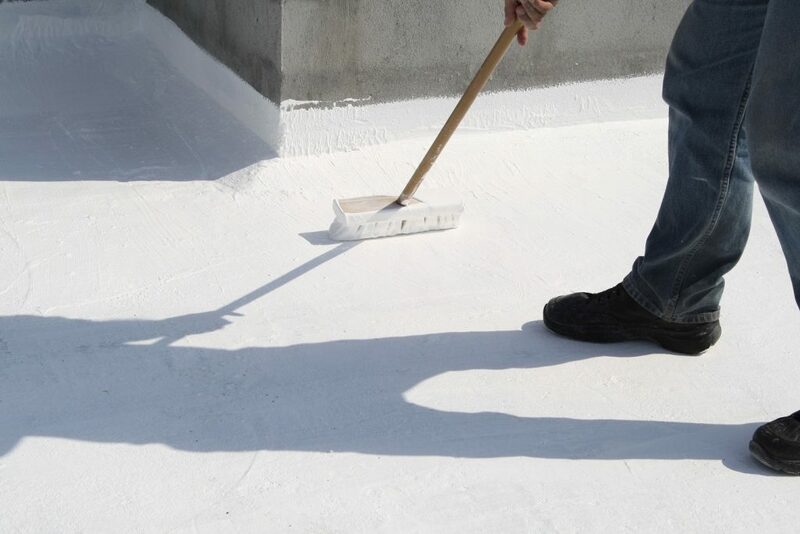 A roof coating is a white paint-like material that is applied to the roof membranes. It hardens and adds an extra layer of protection against the elements. The coating is usually white and dries with a stretchy, elastic feel. It normally takes up to a day to dry completely. On humid days the drying process could take a little longer. The coating extends the lifespan of a roof. It reduces heat transfer into the building and decreases thermal shock. This is what happens when the roof membrane stretches and contracts to the sun warming it all day then cooling off at night. This is especially evident in El Paso and other southwest cities due to the nature of desert climate. A lot of commercial building owners decide to use a coating because the reflective properties can bring down cooling costs in the summer. How is Roof Coating Applied? Roof coating is quite easy to apply. Roofers use rollers or spray methods to apply the coating to the roof. Roofers will first inspect the roof for imperfections. If serious problems are present they will first address repairs. They will also ensure that moisture is not trapped below the service. Cleaning will take place, then the coating will be painted onto the surface. What Roofs Can Coating be Applied To? There are many different types of roofs that roof coating can be a applied to. This can include metal roofs, flat roofs, single-ply, spray polyurethane roofs, Build-up roof systems, and more. Unfortunately, these coatings are ill-suited for shingled roofs with gravel like granules. If you are looking to improve energy efficiency and extend the lifespan of your current roof, be sure to contact us at El Paso Roofing Co.. We can apply a coating to your roof as well as ensure your roof is ready. If there are repairs or issues to take care of they will be addressed first before the coating is applied. Contact us today with your questions or to set up a consultation.